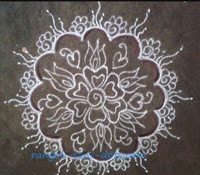 The first is a traditional geethala muggu or rangoli with lines that starts with a basic krishnan dindu pattern as it is called. 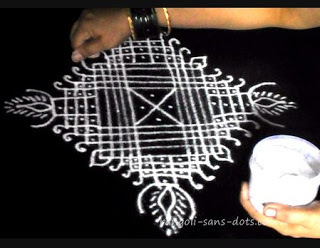 A swatik design is drawn and small parallel lines are drawn inside. 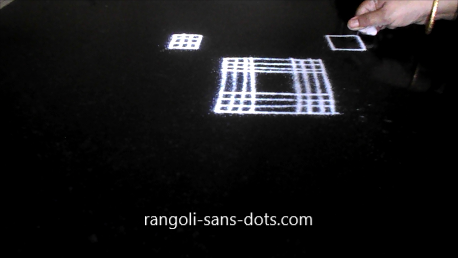 From the top of the central pattern connect these grids with four lines as shown in the pic below. 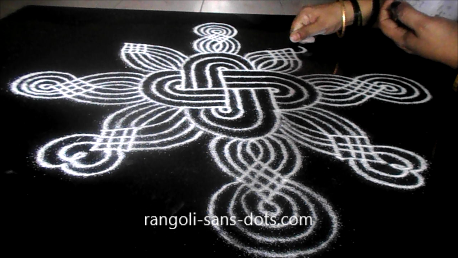 This is done for all four sides. 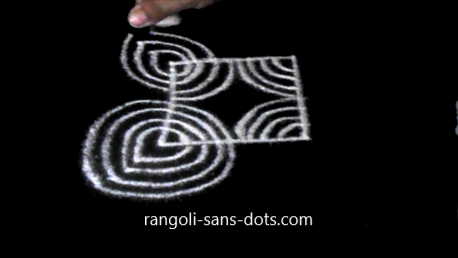 Now repeat the steps to get four more such patterns in the gaps . 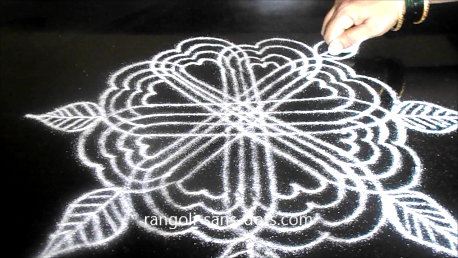 Now make the sharp edges smooth with curved lines as shown. 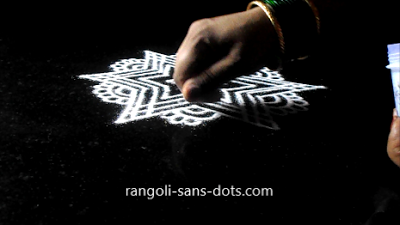 Decorate with a kaavi border for the Sankranti festival decoration. 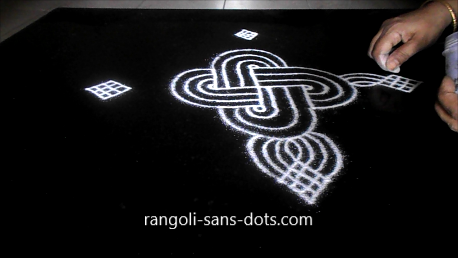 The next rangoli or muggu is a very traditional padi kolam variety with the basic square pattern. 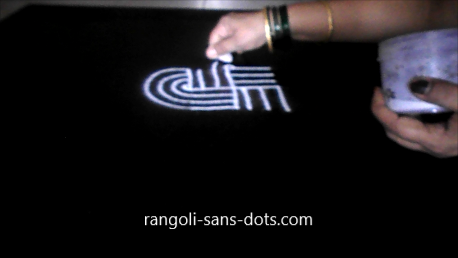 The dot pattern used is 5, 4, 3 idukku pulli. 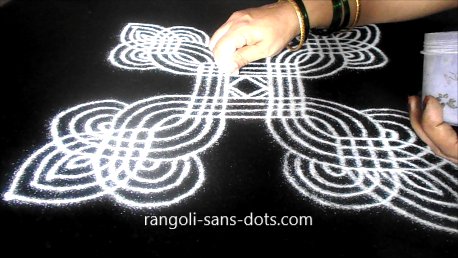 Form the pattern at the centre and outside using the dots. 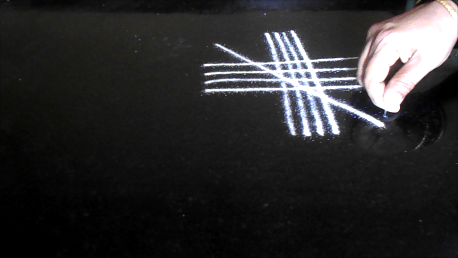 The other pictures should make the steps self explanatory,I hope. 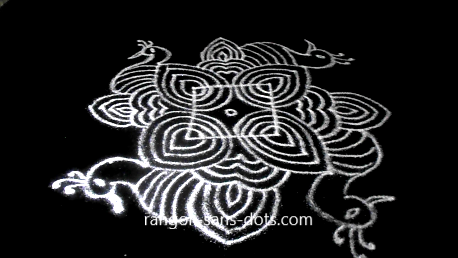 The kolam ( or muggu ) is a basic padi kolam. 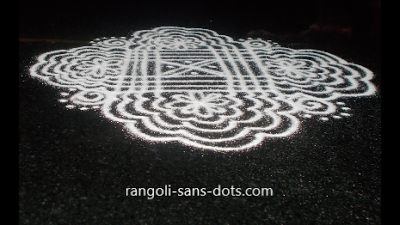 I am of the opinion that traditional padi kolam should start with a square base. 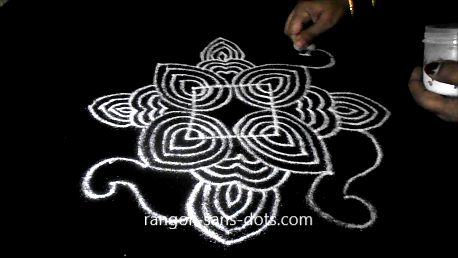 I use four or five lines for a padi kolam or any lines kolam. 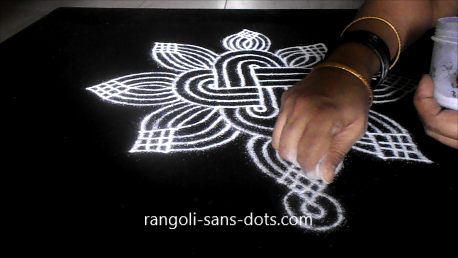 There is a school of thought which feels that padi kolam should be with 2, 4,6 lines only ( i.e the number of lines should be even). 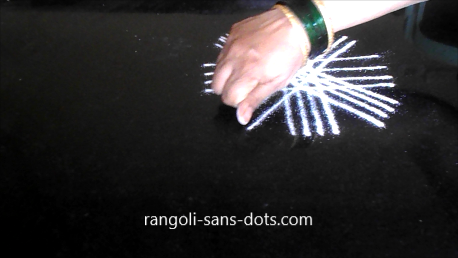 This was a point of discussion on my YouTube channel with some subscribers through the comment form . 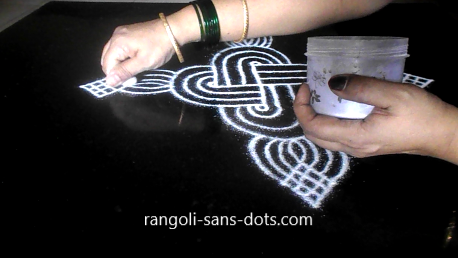 While I use 4 or 5 lines my elder sister is very particular that five lines are used for padi kolam. 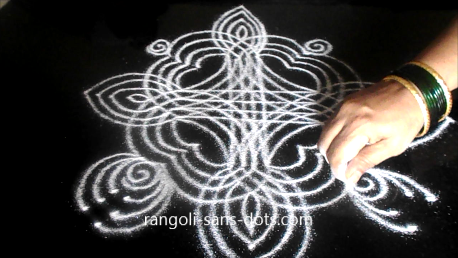 In fact she called me from Nagpur over telephone and discussed my video on my YouTube channel and asked why I was using 4 lines when our family tradition is using 5 lines. 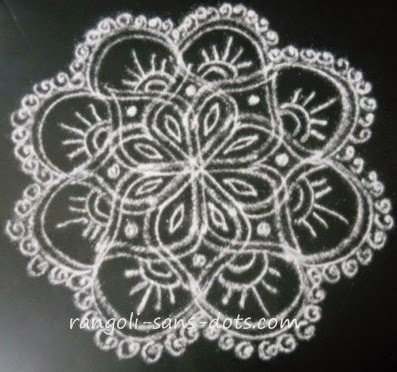 Though there are no hard and fast rules in the number of lines in a traditional padi kolam ,we may have 4 or 5 , the second option is two lines only. 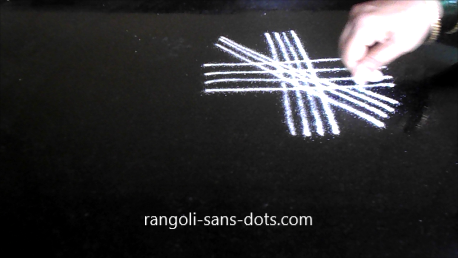 Any other number is usually not used. 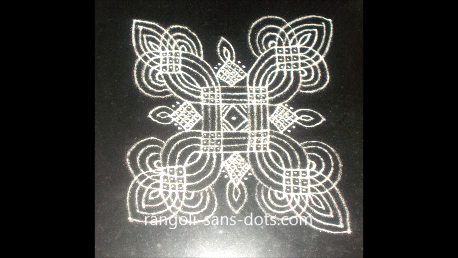 Traditional lines kolam may differ from traditional padi kolam in that they need not start with a square base and so also the number of lines. 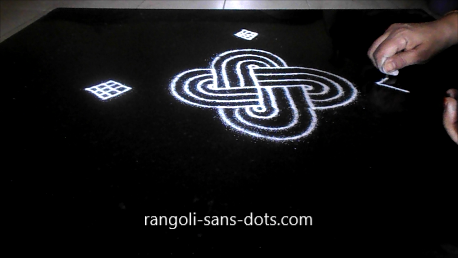 Two more muggulu that are lines muggulu designs for Sankranti festival. 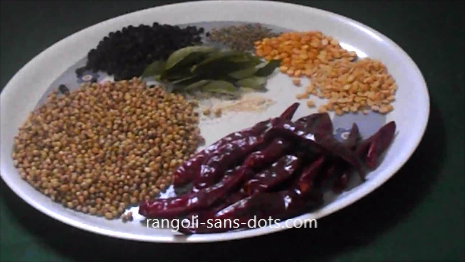 This variety of muggu is one of the favourite categories in our family particularly for festivals. 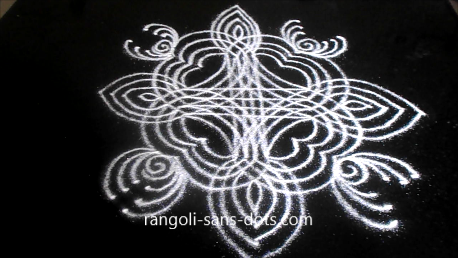 These kolam or muggu are drawn for auspicious occasions and Sankranti is also called Pedha Pandaga in Telugu in my maternal home town , Vizianagaram near Vishakapattinam. 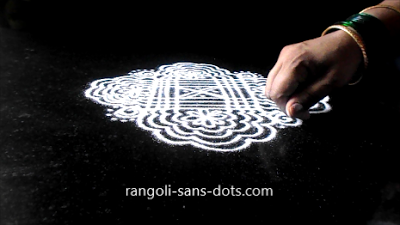 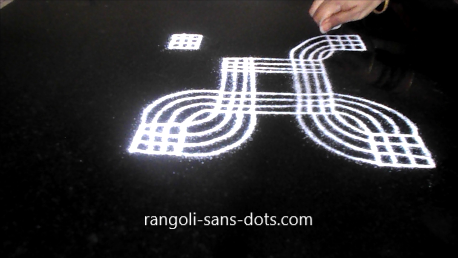 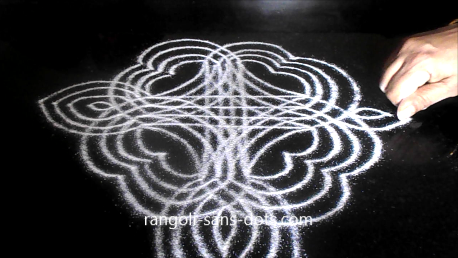 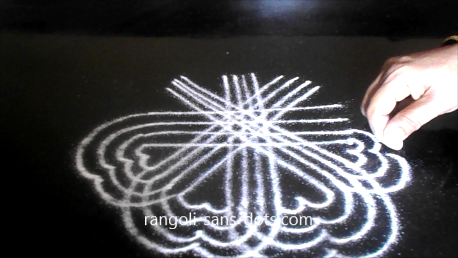 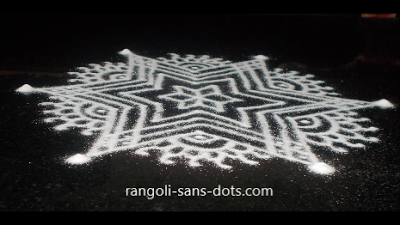 So these are lines rangoli designs are very popular during Sankranti festival celebrations . 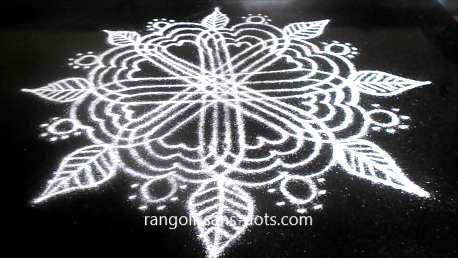 These celebrations are as popular as the Pongal festival celebrations with kolam and new clothes and of course both are celebrated at the same time of the year. 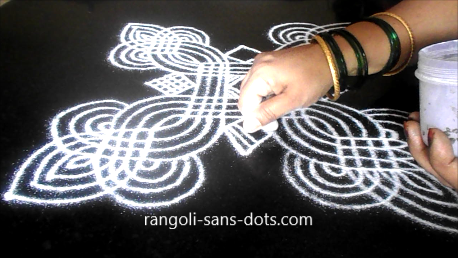 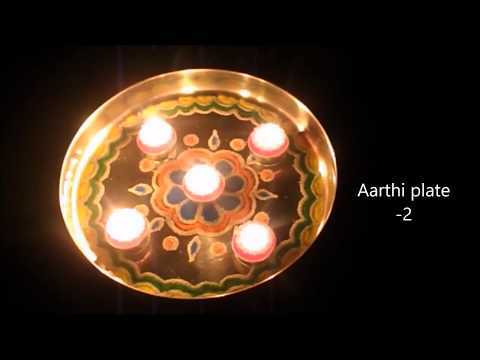 We can also try something different in padi kolam or geethala muggulu as we say in Telugu . 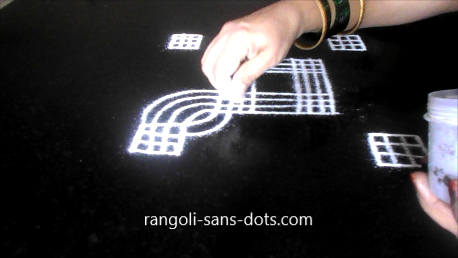 After drawing the basic patterns with lines we can try to create some birds patterns in the muggu with lines only. 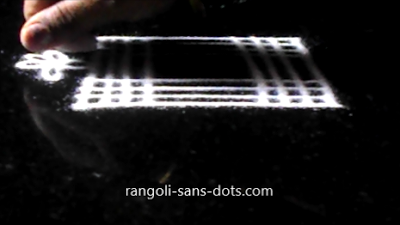 The pictures of the muggu show how and they can be followed easily , I presume. 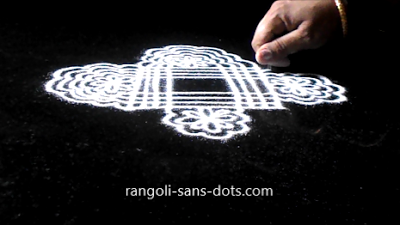 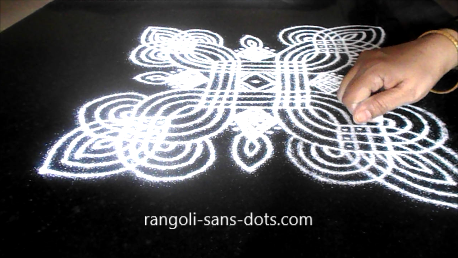 One of the many questions asked by viewers is the quality of lines in the rangoli designs I draw. 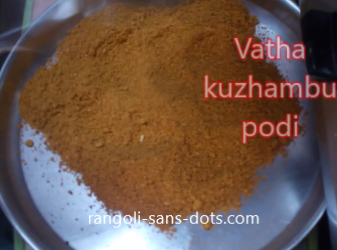 I use a mixture or rice flour and traditional kola podi in the ratio 1:3 . 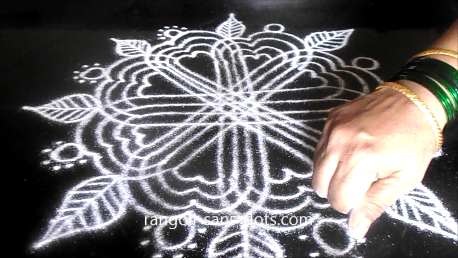 So this mixture gives the perfect balance for colour and texture we need for the right kolam powder. 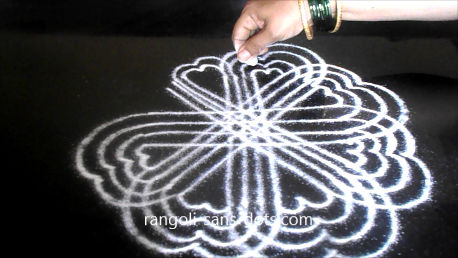 I am asked on YouTube that my bangle wearing style is very beautiful ! 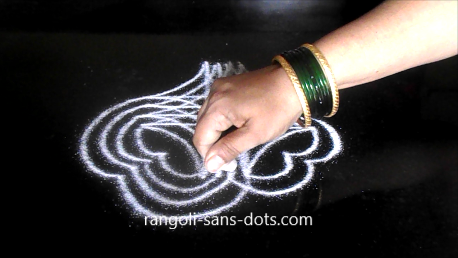 It is just our tradition is wearing green glass bangles separately or with gold bangles. 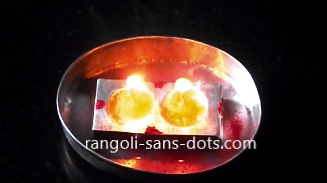 So when I wear two gold ornaments on the hand and that is invariably the right hand , the green glass bangles are between them. 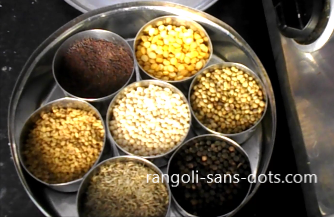 If I wear four gold bangles , I wear green ones between any two gold ones. 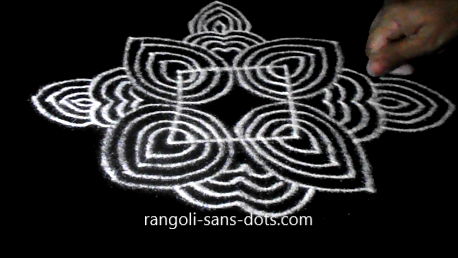 I am pleasantly surprised that I am observed so closely in my rangoli videos. 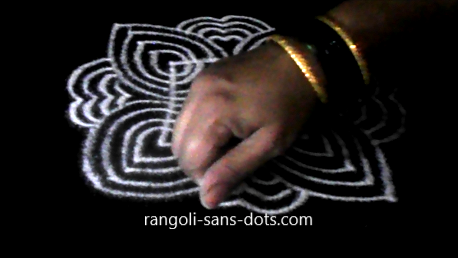 Actually one lady raised doubts about who is drawing the kolam when I changed my style of wearing bangles ! 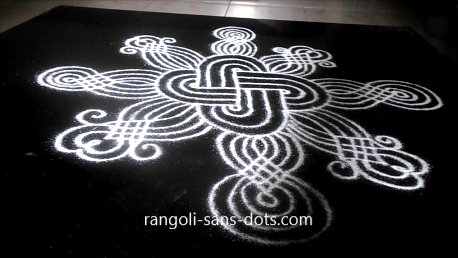 very nice one. 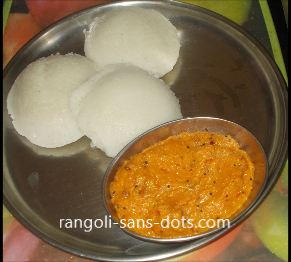 naturally where there is a fruit there will be a bird.